Let’s face it: The necktie is an endangered species. As clothes maven Nicholas Antongiavanni lamented in The Wall Street Journal not long ago, the tie’s “status as the sartorial signifier par excellence of business, seriousness and ceremony is in jeopardy.” No kidding. The tie, Antongiavanni wrote, may survive in government and within certain tony enclaves, but that’s about it. And yet there’s the rub: As long as the necktie remains a requirement somewhere, we’ll need to know how to tie the things. Lab48’s vTie and vTie Premium for the iPhone and iPod touch are helping preserve what’s becoming increasingly arcane knowledge. 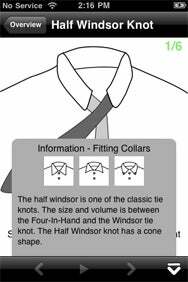 The app provide step-by-step instructions for a dozen necktie knots, from the well-known Half-Windsor to the more unconventional and esoteric Atlantic. Tie One On: Both the free vTie and its $2 premium edition give you step by step instructions on tying assorted necktie knots. The optional slideshow feature takes you through each knot step by step. The illustrations and instructions are some of the most detailed and clear that I’ve encountered. (A few years ago I found myself in a motel room struggling in vain to remember how to tie a Windsor. The instructions I found on the Internet were worthless. I wish I’d had this app.) The app lets you control the slideshow speed, from very slow (about eight seconds) to a fast (but less helpful) three seconds. For better or worse, most men nowadays put little thought into matching their ties with their shirts. vTie includes a helpful guide to pairing specific knots with particular collars. Who would use this app? The man who wears a tie for odd occasions—a job interview, a funeral, or maybe a wedding. The young man, a high schooler or a college graduate just starting out in the world who never learned to tie a Half-Windsor may find vTie a worthy investment. What’s the difference between vTie and vTie Premium? Apart from the slightly different names and price, the main difference is the premium app includes several more styles of knot, including a few you might actually want to use, like the bow tie.